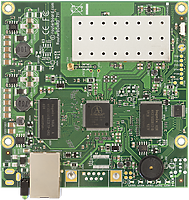 The RB711 is a small CPE type RouterBOARD wireless router with an integrated 5GHz 802.11a/n wireless card. This device is available either with a u.Fl connector or a MMCX connector (models RB711-5Hn-MMXC and RB711-5Hn-uFL). The integrated wireless card is capable of up to 23dBm transmit power output. Temperature range -25? to +65?